We’re proud to offer exclusive programs for Tiger Scouts, Wolf Cubs, Bear Cubs, and Webelos! Each program is designed to help packs fulfill requirements towards Cub Scout Adventure requirements and earn a New-York Historical Society Patch. Private scout programs allow you to pick the day and program for your troop. 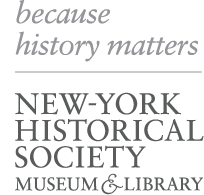 All New-York Historical Society Museum-based Cub Scout troop programs satisfy requirements towards select badge fulfillment. Advance registration is required. Cub Scout programs are 90 minutes long and may be reserved during Museum hours. Programs cannot be extended past 90 minutes. If a group arrives later than the appointed time, the program will be shortened to end at its original time. Field trips cost a flat rate of $150. Payment must be received to make a reservation. We accept credit cards, and checks. On Scout Days, children will be able to participate in fun and informative activities led by museum educators. Advance registration for Scout Day is recommended. Take a highlights tour around the museum to learn what a museum is, why museums exist, and how the people who work in them keep them running. Explore 500 years of history, learning and implementing the skills of observation, identification, and drawing conclusions about artifacts and works of art. Learn to “read” a painting for clues about the past, analyzing and interpreting symbols and themes in different works of art from our world-renowned collection. Scouts learn how paintings are made, why they were so important to people in the past, and why they are useful to us in studying history. Scouts learn vocabulary for works from the colonial era through modern art, plus they will work independently and in groups to study elegant portraits, busy cityscapes, and the largest Picasso in the United States! What’s in a lamp? Consider art, gender politics, labor movements, and industrialization through the lens of the Tiffany Design Studio’s iconic stained glass. Explore the process of creating rare and beautiful Tiffany lamps, from inspiration and design to glass cutting to assembly. Meet Clara Driscoll—Tiffany’s talented head designer—and the team of workers who helped her create these precious lamps. Learn what life was like for women in the workplace in the early 20th century by hearing their own stories. Why did the Dutch West India Company start a settlement in New York Harbor? What was it like to live in a tiny town at the edge of the known world? Scouts learn about the expeditions of Giovanni da Verrazzano and Henry Hudson; the economic and religious factors that influenced colonization; and the challenges involved in building and living in New Amsterdam—the remote outpost that would become New York. Since 1609, waves of immigrants have arrived in New York Harbor. Encounter newcomers from different cultures around the globe, and learn how each wave helped shape the city we know today. This program explores immigration to New York from the 17th through 20th centuries, considering in detail the reasons why people left their former homes—lack of economic opportunity, famine and disaster, and political upheaval—as well as the factors that brought them to the United States, such as religious and political freedom and opportunities for the future. Scouts explore Enduring Ideals: Rockwell, Roosevelt & the Four Freedoms, the first internationally touring exhibition focused on Norman Rockwell’s Four Freedoms paintings (1943). What significance did these famous paintings—inspired by the words of President Franklin D. Roosevelt—hold for Americans in the 1940s, and what can they tell us about the power of illustration? In this program, scouts consider what it was like to live through World War II and encounter additional artists of Rockwell’s period who created powerful images. Learn to “read” a painting for clues about the past, analyzing and interpreting symbols and themes in different works of art from our world-renowned collection. Scouts learn how paintings are made, the meanings they held for people in the past, and why they are useful to us in studying history. Scouts practice critical thinking and use new vocabulary in interpreting portraiture, Hudson River School landscapes, and scenes of everyday city life. Use the long political career of President Franklin Delano Roosevelt (1882–1945) to learn about the Progressive Era, the Great Depression and the New Deal, and World War II. Learn about the life, ideas, and influence of the New York State senator, governor, and 32nd U.S. president through Museum artifacts. To learn more about educator-led scout education programs, Cub Scout Independent Studies, and Scout Days, please contact Kristi Tremblay and Nora Gorman in the Group Sales Department. Call (212) 873-3400 ext. 352 or email group.tours@nyhistory.org for more information.